A group of non-profit attorneys have outmaneuvered a port trucking enterprise, thwarting its attempts to avoid misclassification liability through bankruptcy protection. On July 6, Asian Americans Advancing Justice-LA and the Wage Justice Center secured final approval of the landmark $5 million class action settlement against QTS Inc. and its related entities including LACA Express and Win Win Logistics from Judge Elihu M. Berle of the Los Angeles Superior Court. The settlement is a critical development for other port trucking companies seeking to shield assets through corporate shell games or under U.S. bankruptcy law when faced with employment classification-related litigation (more on this in the next Port Innovations blog). The non-profit legal service organizations representing the Latino and Korean immigrant port drivers utilized innovative legal strategies in bankruptcy court to hold accountable a port trucking enterpris e composed of several intertwined corporate entities. One of them, QTS, filed for Chapter 11 bankruptcy protection in 2014 shortly before the motion for class certification in a misclassification suit against the family of companies was to be certified. Shortly thereafter, the case was converted to a Chapter 7 liquidation and QTS was sold for just $50,000. However, the liquidation and sale of one entity did not succeed in inoculating QTS or the rest of the enterprise from the claims in the lawsuit, as the non-profit lawyers pursued the case against the entire interconnected group of entities in bankruptcy court. 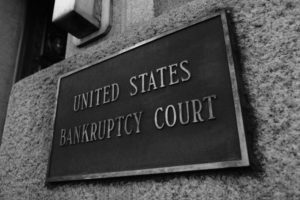 “In a novel move, the drivers transferred their state court litigation into bankruptcy court by suing the non-bankrupt entities as creditors of the voluntarily abandoned and bankrupt entity. They asked the bankruptcy court to consolidate the assets and debts of all the entangled business enterprises. The parties reached the current settlement after 18 months of litigation in bankruptcy court entailing the subpoena of the defendants’ major customers, review of tens of thousands of pages of documents and deposition of the officers of the business entities.” – Asian Americans Advancing Justice – LA, July 14, 2017. The class includes over 400 port drivers who worked for QTS, Win Win Logistics, and LACA Express. Their working conditions were highlighted in a recent USA Today expose on the “indentured servitude” in the port trucking industry, which profiled one of the class representatives, Samuel Talavera, who received a paycheck for just 67 cents after QTS deducted truck expenses from his weekly pay.